We usually run two beginners courses each year, in May and September, from 10am to noon on three consecutive Saturday mornings. 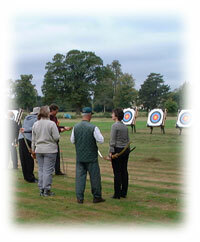 The participants will be divided into groups of four or five and assigned to a target where one of our experienced instructors will introduce you to the basics of archery and gradually acquaint you with better technique as the fundamentals are grasped. Yet archery is a sport where one never stops learning or experimenting, so do not expect to emerge from the course all set to take the Olympics by storm as we will need much more than three mornings for that. But by the end of the course you should understand enough about archery to be able to go forward as a competent beginner. Upon completion of the course you will be eligible to apply to join the club. Please note that we can only consider applications from people who have successfully completed a beginners course, either with us or another club with a certificate as proof. Completion of the course does not guarantee acceptance, as all applications are subject to the approval of the membership at a general meeting and according to the membership levels at that time. Juniors are welcome to attend, but must be a minimum of 11 years of age and accompanied by a parent/guardian at all times whilst on the premises. For safety reasons we are restricted in the number of places that we can offer on the beginners course, and these are reserved on a first come first served basis, and can only be guaranteed by payment in advance. Please refer to our costs page for details on pricing. The course will take place at our grounds on Wergs Hall Road, see the directions page for details. We ask you to remember that beginners courses are run by members who have volunteered to give up their time for the event and are dependent upon their goodwill. Note: Please be aware that we are unable to offer private tuition to anyone who is not a member of Wolverhampton Company of Archers.